i encourage my two cats to compete for my affection by telling each one that she is my 'best girl' whenever the other cat is out of earshot. after only three years, it is still too early to tell if this strategy is having the desired effect. i have, however, noticed a pattern in which one cat always seems to keep me company while the other one sleeps, and i am beginning to fear that i may in fact be 'subject zero' in some twisted plan of theirs. i would elaborate on my suspicions, but Baby Bear is sitting right next to me, so it may be time to change the subject. it has been snowing for most of the past twenty-four hours, and there is a polar vortex rapidly descending on the entire region. 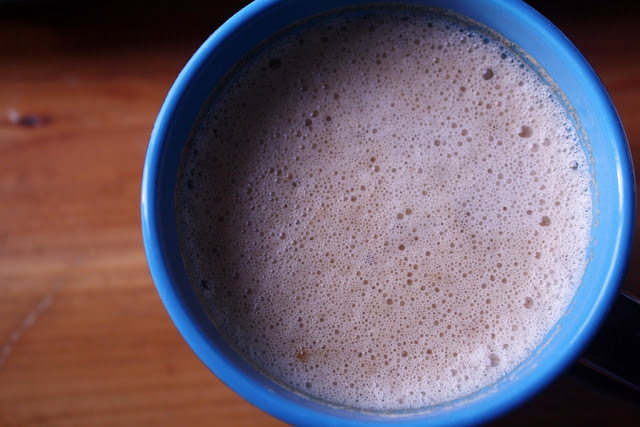 i can scarcely keep up with the demand for hot beverages. 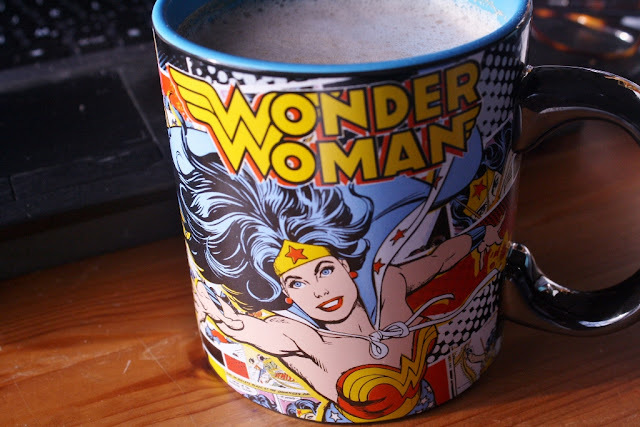 we drink absurd amounts of tea (and the occasional coffee) around here in the Winter, and we prefer to use super-large mugs in order to avoid refilling the smaller cups every twenty minutes. problem is, we were down to one-and-a-half super-large mugs. 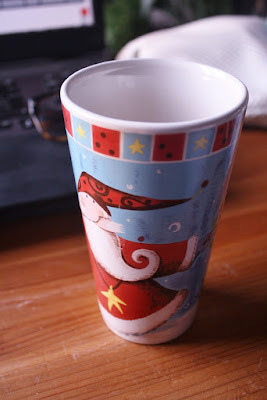 the "half" in question is my white Santa mug, the handle of which had to be reconstructed several months ago with equal parts patience and crazy glue. 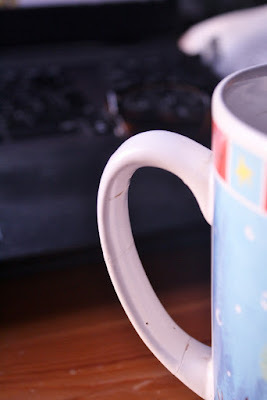 every cup of tea since then has been a gamble with the inevitable. Winter was here, and we needed new mugs. i found myself revisiting this one listing for weeks, so it seemed a good time to make a purchase. me: i really want to support hand-crafters. we should go on Etsy and find a potter. maybe we can custom order mugs with something interesting written on them or with iconic Canadian images to celebrate our support for small businesses. him: remember when i told you about that four-week pottery workshop at one of the local art schools? we should take it so we can make our own mugs. me: that would be kinda awesome. 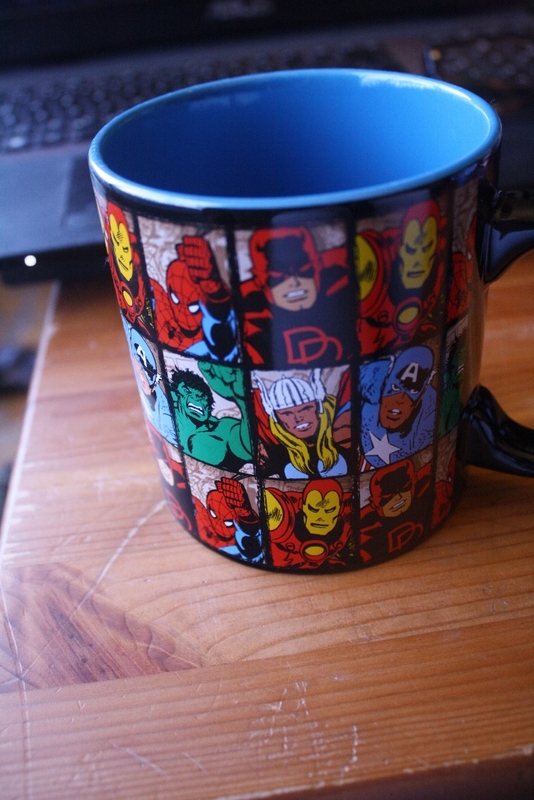 me: ok, so we each get to pick one Disney mug and one Marvel/DC Comics mug, agreed? do we need anything else from Amazon? i was keeping my fingers crossed for something awesome in a Wolverine theme, as he is who i have deluded myself into thinking i would be in a comic book reality, but then i scrolled past this one, and kept coming back to it. girls! i did have to draw the line at any silly Disney princess nonsense, since that has never been my cup of tea! 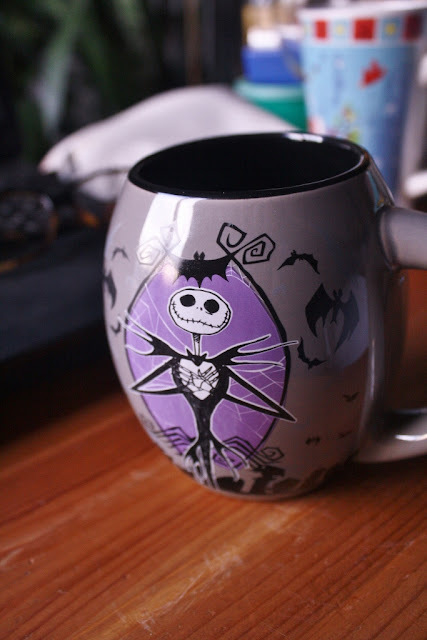 i do, however, have a soft spot for The Nightmare Before Christmas. it is just Grimm enough to cut through the sugary-overload of the usual holiday season offerings. yes, i am that person. 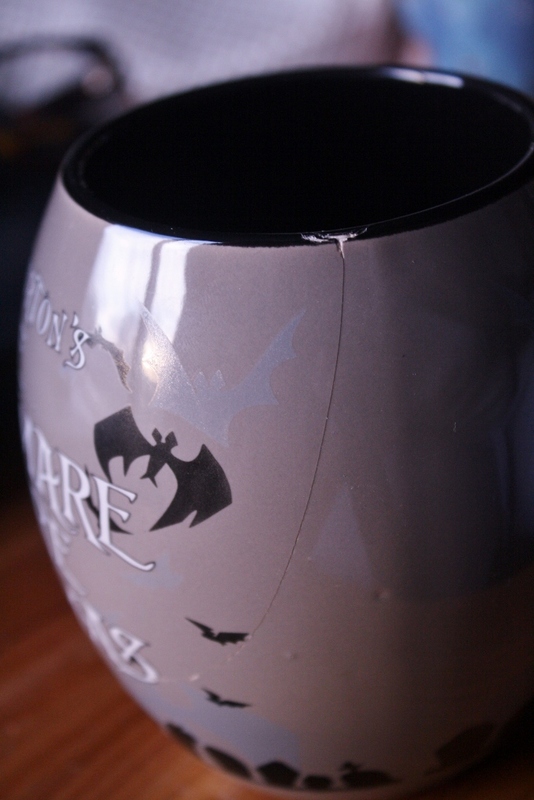 in typical Amazon fashion, the items arrived in as many individual boxes as they could possibly manage, but the Nightmare cup still sustained a massive crack en route. a replacement was dispatched, and i was advised to dispose of the damaged cup as i see fit. where did i put that bottle of crazy glue? 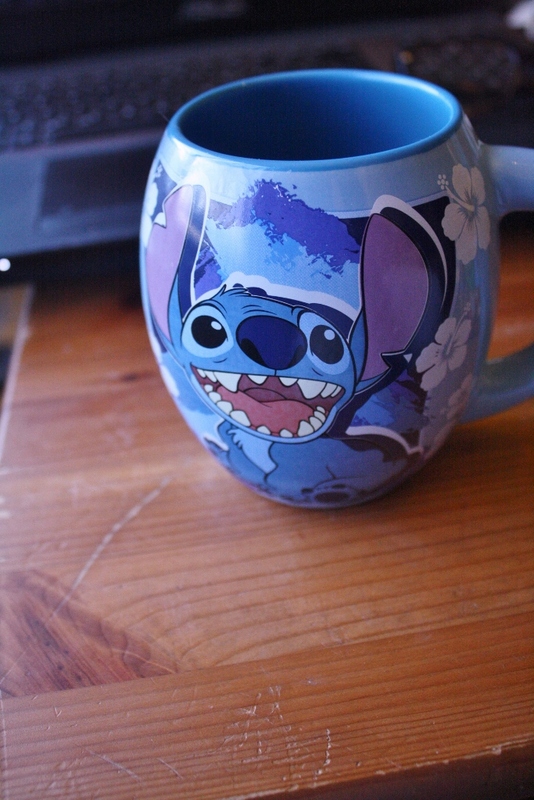 i have a hard time letting go of mugs, especially the large ones i use every day. 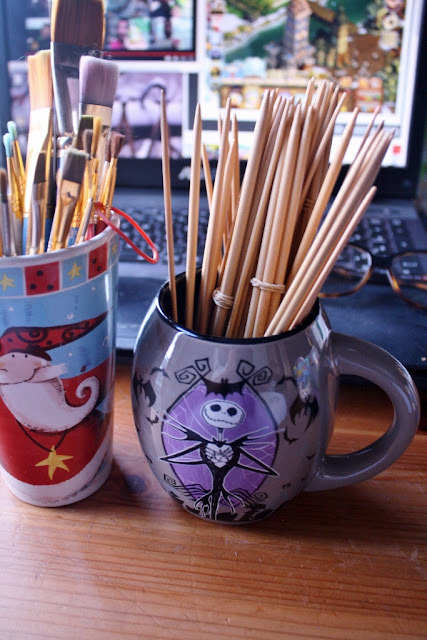 Santa is going to be retired from regular rotation and the cracked Nightmare mug will join it as holders for craft supplies. the record for 'oldest broken mug' belongs to this green one, which has served as drip-catcher to this little plant for the past twenty years. [the frog was pilfered eons ago from one of mom's plants, and i gave him a small rock for company, because i am a compassionate thief]. i broke my go-to mug back in undergrad, and my best bud got me this one as a replacement... which i proceeded to chip and crack some several months later. 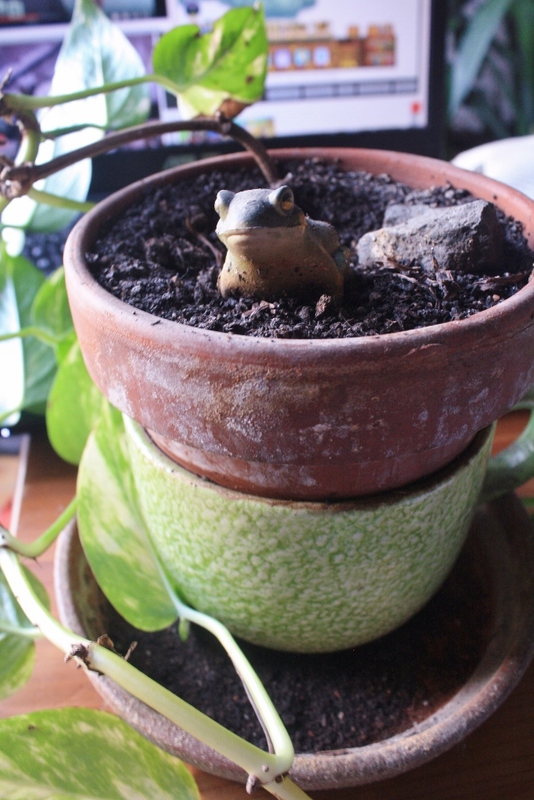 i did not have the heart to trash it, so it became home to the clay pot containing the few leaves i had pinched from mom's pothos (E. aureum), back when i "borrowed" the frog. 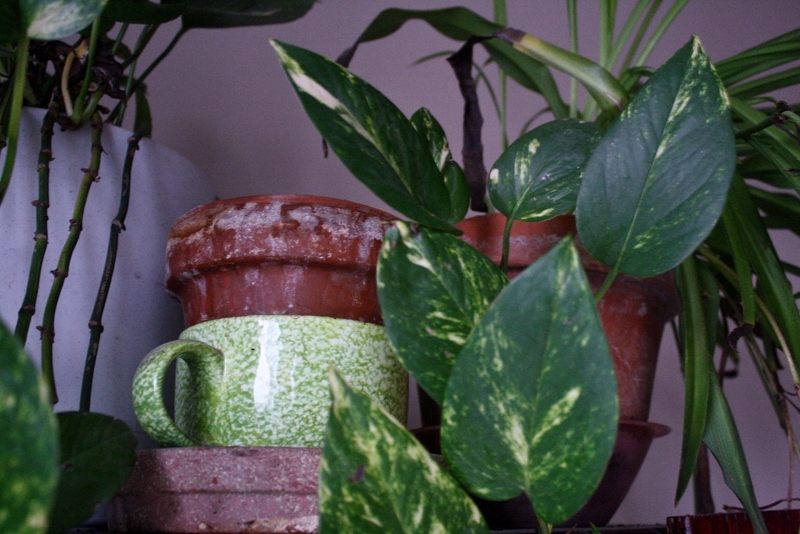 this little plant has tagged along for the past twenty or so years of my life, and i hope it will see me through a few more decades of adventures. on a parting note, i would like to report that a murder of crows has descended on a tree close to our building. there must be nearly two hundred of them perched along the bare branches, in stark contrast to their snow-covered surroundings. it is intensely unnerving to see the occasional large cloud of dark shapes circling that close overhead, and the cacophony bears a striking resemblance to a rallying cry uttered before a battle. i saw the movie. this will not end well. Thanks for making me laugh out loud. Have often suspected the cat who lets me live in his house of ulterior motives. Carry on! 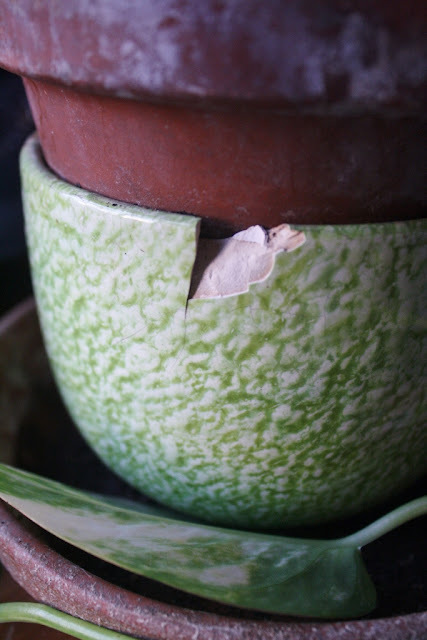 I do love your collection of pots within pots with clay water catchers under them and yet another plate to keep the seeps off the table...it becomes an art in itself, doesnt it. despite my mother's best efforts, i have never been able to get into super-pretty flowerpots, where the container seems to be far more the focus than the contents. i prefer the mismatched, rustic approach as it encourages/challenges me to re-purpose items that would otherwise end up as waste. exactly. I had a mother like that too, and sometimes her flowerpots were fancier than the contents. They now sit outside in the garden, more as ornament and frog houses than anything else. Frogs need shelter too.